Homepage. This page: As car heaters were not standard fitment even throughout the 1960s on many cars, here are some options. By the late 1960s and early 1970s, all but the most basic cars had some form of heater built into them. Prior to that, in the 1950s and early 1960s,only buyers of mid-range cars and above could reasonably expect to find a heater as a standard fitment. Small-car buyers would usually have to specify a De Luxe specification if they wanted warmth behind the wheel, assuming there was a De Luxe option, as most poverty-spec models came without any such fripperies. Even a passenger sunvisor was an extra-cost option on many cars. Up until the 1950s most motorists could only dream of heating in their car, as aftermarket heaters were seen as an expensive luxury to many, and with money tight after the war, it was often expensive enough simply keeping the car going at all. For motorists who had graduated from two-wheel transportation, simply having a roof over one's head during the winter was comfort enough! Of course everyone was a lot hardier in those days, and thought nothing of donning driving gloves and sturdy headgear before heading outside to the frozen wastes, often to churn their old banger into life on it's starting handle. That was after scraping off all the ice from the windows, inside and out, and possibly extinguishing the paraffin-fed sump heater. 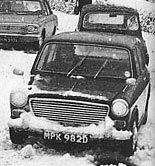 Whereas British winters now usually consist of a few inches of the white stuff, and the resulting gridlock as the country grinds to a halt, winters in the years following the war were often seriously cold, lasting for a good few months, with snowdrifts and cars fully buried in snow not just being the preserve of really remote areas, as is often the case now. So, assuming 1950s' motorist had a few spare quid in the pocket of his brown overcoat, what optional heaters were on the market to choose from? Here are just a few of the more popular makes around at the time, available from outlets such as Brown Bros, Halfords and many motor accessory outlets. Tudor was one of the best known suppliers of car accessories in the 50s and 60s, having spotted a market for aftermarket car accessories and upgrades, recognising that many people owned very basic motorcars, and might want to upgrade and improve them, as time allowed. There were many hands-on motorists around in those days, tinkering away each weekend with their car, so the market for such gadgets was huge. First of the Tudor car heaters shown above is the Twinfan Model, costing £11 10s 0d (or £11.50 in modern money). Various installation kits were available, for popular cars such as the Morris Minor (803/948/1098cc), Marks IV to VIII Hillman Minx, Standard 8 & 10, Ford Anglia & Prefect, Austin A30 & A35, Austin A40 & A50, and the Vauxhall Victor range. Circular in shape, it was designed to fit under the car's parcel shelf or dashboard, and incorporated two opening vents, allowing air to be distributed to either driver or passenger, or both. It would be plumbed into the car's cooling system, and incorporated it's own small radiator, through which an electric fan blew, in the usual way. The second Tudor heater shown is the Mk.III "Fresh Air" Car Heater, and worked by drawing air from behind the main radiator into the unit, in which a motor was fitted. A large rotary controlled rheostat on the front of the unit controlled the motor speed. Two versions were available, one suitable for a 6v car (say an upright Ford Pop, or a pre-war Austin), the other for a 12v equipped car. The smaller heater unit shown on the right isn't actually a Tudor, but a model sold by the Aquatex company called the "Cosycar" Interior Car Heater, probably re-badging a model from one of the usual heater manufacturers. Another once-familiar name in the world of car components and accessories, the Smiths name would have been found on most of the British cars sold in those days, when cars were designed and manufactured in this country, using British component suppliers and manufacturers. Smiths usually supplied the heaters fitted as standard to production cars, so were well versed in the subject. Three examples of optional Smiths in-car heaters are shown below for your perusal. The first heater, again designed to be mounted behind the dash, was a universal model designed to be compatible with most cars and layouts. A hinge-down vent at the front of the unit controlled air into the cabin, and two outlets on the top enabled warm air to be directed at the screen, for demisting. The basic price for this model in 1961 was £15, with extra fittings for the optional demisting capability costing 15s-20s extra, making it the most expensive of the three types shown here. Next in this selection, the Smiths Universal car heater, rated at 2Kw output (compared to the 21Kw of the previous type) and sold for £10. As with the Tudor Twinfan, separate hinged ventilators allowed the blast of warm air to be controlled by both front seat occupants. Demisting functionality was also built in. The third model is the £9 Smiths Junior, which did away with separate controls for the front seat occupants, simply directing warm air rearwards. Next, the K-L car heaters, another once-popular brand of car accessory. The first model shown, the K-L 54 (2Kw) was designed for the Austin Mini 7, A35, A50/55, various Fords including the 105E and 100E, Minxes, Minors, Standards, and the Triumph TR2 & TR3. Priced at £11 it came with a remote rheostat that would be fitted in a convenient location for the driver. In fact I've one of these heaters sat in the garage, removed from a Minor in a scrapyard many years ago. The second heater is the K-L Monitor, specially designed for cars that relied on the thermo-syphon method of engine cooling. Primarily this system was found on pre-war cars, although Ford famously stuck with this antiquated system with it's upright Ford Pops and Prefects throughout the 1950s. As Ford Pops didn't come with a heater as standard, I'm sure many K-L Monitor installations found their way into old 103Es. Next is the K-L 502, a combined heater/demister designed to be mounted under the dash, or within the car's engine bay, probably more suited to cars that couldn't accomodate a large boxy heater unit such as the K-L 54 below the dash, thanks to it's shallower design. The final K-L heater shown is the new-for-1961 K-L Monsoon, suitable for any car fitted with a water pump, it churned out 2.25Kw of heat, and was finished in silver. The twin adjustable vents look very similar to those seen on certain Smiths and Tudor heaters further up the page. If Mr or Mrs Motorist had a smaller car, where under-dash space was at a premium, then some of the larger heater units discussed above might not have been an option. However not all hope was lost, as the "Heat-A-Car" unit was a very different design to the norm. Instead of a bulky heater radiator and motor unit hung beneath the dash, this alternative featured a 24" tube, with a clamp at one end that fitted to the car's steering column, and a bracket at the other that screwed to the facia. No motor was involved, you simply plumbed it into the car's cooling system and it enabled hot water to flow along the tube, radiating heat as it did so. Handy for drying damp gloves on too I imagine, although doing so would soon steam the windows up. "Cosy warmth for all passengers" was assured, there was ".. nothing to go wrong .. " either which no doubt re-assured anyone who had concerns about the potential for boiling water dripping over their knees. Over 20,000 had already been sold at the time of this advertisement (the late 1950's). Gushing praise was offered by one happy customer in Kent: "I purchased one of your Car Heaters ... and may I add, am most pleased with it". I wonder how many are still in use? When information on other aftermarket car heaters turns up, I'll add it in here. As car heaters weren't always the most effective of items, it was important that the rest of the car was upto scratch. Fitting an external radiator blind (muff) was often a good idea, encouraging the engine's coolant to get upto temperature as quickly as possible, and therefore speeding up the effectiveness of the car's heater system.